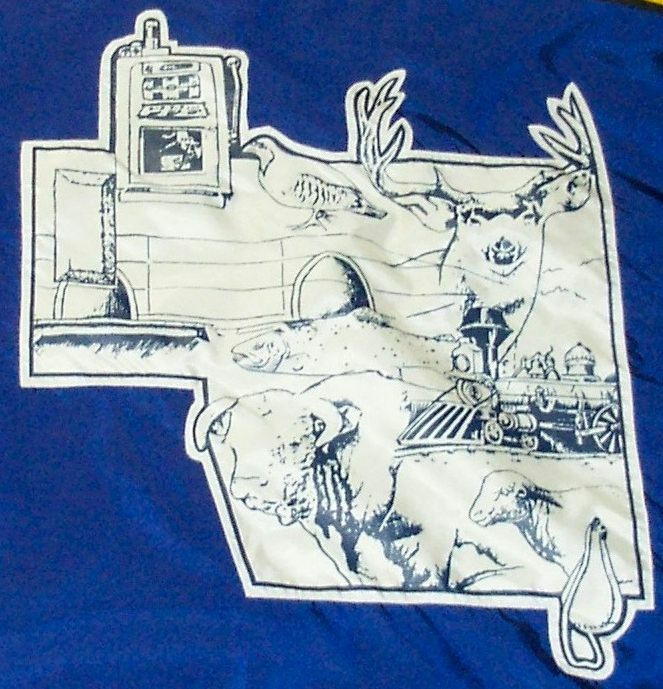 A blue background, bearing the county map, into which is arranged various features, including a deer, a bull, a sheep, a bird, a slot machine, a stirrup, a viaduct and a train with cowcatcher. 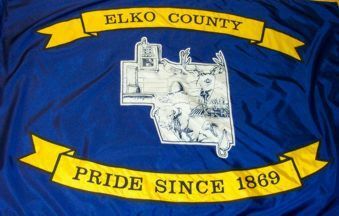 Above and below are two gold ribbons, the upper one stating the county name, and the lower one PRIDE SINCE 1869. A blue background, mostly covered by a white shape, an outline of the county map, if a bit stretched to fit. In the lower hoist the name ELKO, in the upper hoist crossed pick and spade, and in the fly a ring with a silhouette of a bull's head in blue. This flag is of uncertain status.